I think this is a wonderful resource. It’s simply written therefore easily accessible to everyone. It has obviously been written by someone with a wealth of hands experience of children and practitioners. There is a handy reference section in the beginning that explains terminology and records outcomes for Literacy and Numeracy should these be required. This makes the activity directions less intimidating yet allows for cross referencing where this may be necessary of required. There is just enough theoretical information given to ensure practitioners understand why the activities- and play in particular- are good for children’s development without overwhelming them with information. The sections on how to go about the task of stimulating children (Why learning through play and creating play spaces) are simply written making even a beginner feel confident of success. The activity ideas are comprehensive, excellent, fun and simply described . They seem “tried and tested” and so can successfully be used by people with little or a great deal of experience for stimulating young children in their homes or in a centre based situation. They cover many developmental needs and ensure whole child development. There is good focus on Literacy and Numeracy skills. The resources/equipment required for the majority of the activities are found in most homes or are easily acquired at very little cost. I like the way the activities are listed under the resource. This allows for easy reference for ideas associated with any particular resource/piece of apparatus. A comprehensive collection of activities ideas for that resource then follows. There is enough scope in the described activities for a range of children’s ages. Your book arrived yesterday and it’s absolutely wonderful. I’ve been paging through it, grinning at some familiar activities from when I was young but so much of it fresh and new. It’s a remarkable resource – and an important one too. 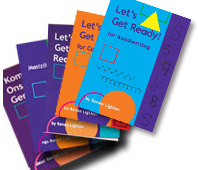 With her newly published book ‘Let’s get ready’, Renee provides a practical tool kit and a treasure chest of ideas on how to playfully explore with your child the world of words, numbers and conceptual thinking. 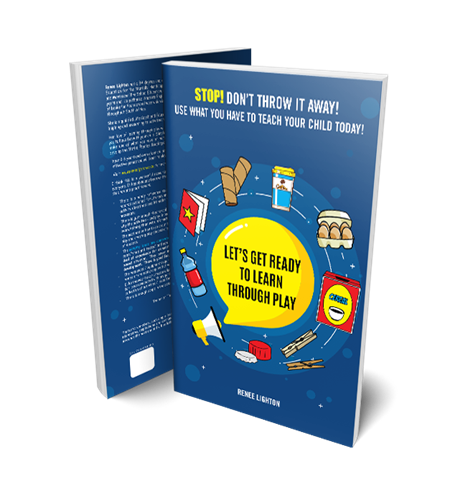 Aimed at parents and teachers of 3-7 year olds, the book helps prepare both you and your child for interactive ways of learning. Simple tips on how to use everyday household materials will make you aware of different methods of learning and help you look at playtime with different eyes. Renee’s wide knowledge and abundant generosity shine through in sections also aimed at younger children, making this a great resource from early childhood up to the school starting years. The book can be bought directly from Renee www.reneelighton.co.za and will soon be available in book stores. This book is awesome! Think it should be compulsory reading for ALL parents! Well done!